We are delighted to announce the date of our first ever concert in Kythera at the beautiful amphitheatre at Zeidoros Artspace in Kepsali. On the 9th August 2016 five of our musicians will travel to Kythera to perform a Mozart string quintet and the inspired first string quintet of Felix Mendelssohn, written when the composer was only 18 years of age. 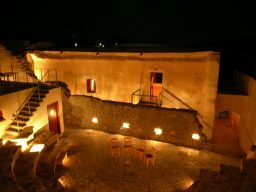 We hope this to be the beginning of a long relationship with the people of Kythera. This concert is made possible by the generous support of the Embassy of the Federal Republic of Germany.